Ex Minister for Social Development, Steve Maharey, is back today in the DomPost claiming his welfare policies worked and there was no need for National to re-invent the wheel. There is not the space here to list the policies developed to implement the framework, but it is worth noting that they were the result of a concerted effort to draw on the best of international and national thinking. Did it work? Yes. Unemployment fell dramatically and the number of people on the domestic purposes benefit declined. 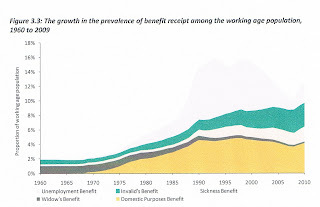 Unlike in all other OECD nations, the increase in the number of people claiming a benefit because of a disability or an illness began to slow. 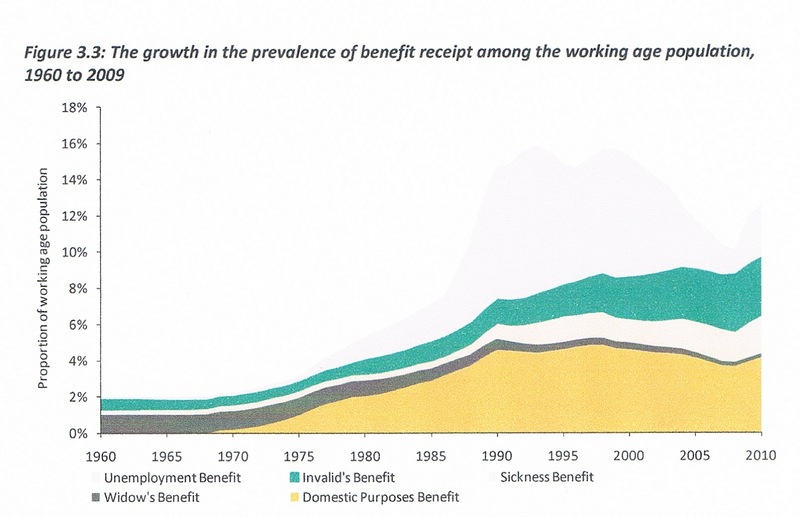 Note the green band and below represent people who generally spend many more years on a benefit than those on the unemployment benefit. The vertical axis shows percentage of the working-age population. So under Labour inroads into dependence was not the big-tick achieve Maharey claims. Evaluation showed that the policies made a measurable difference. Treasury was so impressed when $300 million was returned to it in one year that it made the advances in social policy a feature in its annual report. Despite this, when a change in government occurred, it was as if a new start had to be made. A welfare reform working party was established and it operated as if in a vacuum. Years of experience were wasted. Now, we have a new policy framework which seems to be based on the idea that benefit numbers are rising because people do not want to work. History teaches us that this assumption is not well founded. There are those for whom work is anathema, but most people take work if they have the skills for the job, it pays a wage they can live on and details, such as having a safe place for their children to stay, are taken care of. Sole parents are a good example. Although current policy portrays sole parents on a benefit as young and irresponsible, they are typically women in their early 30s who have left a relationship. They stay on the benefit for a few years at most and then get on with their lives. How much better current policy would be if it had built on previous experience. "How much better current policy" is now it is evidence-based. According to just-released Cabinet papers, at November 2011, 29 percent of single parents on the domestic purposes benefit had included additional newborn children in their benefit. Welfare commentator Lindsay Mitchell said that the paper describes how parents who have additional children are more likely to have started on the DPB with a newborn (rather than having exited a relationship with a child), and have no record of having been employed before, after or during spells on a benefit. The paper also describes the higher incidence of Maori adding children to a benefit. It says that the on-benefit birth rate has increased between 1997 and 2010 from under 35 to 50 per 1,000 women receiving the DPB . Mitchell says these are the circumstances that have prompted the government to introduce policy to reverse this trend. "It is well-documented that children who spend many years in workless homes experience poorer social, health and educational outcomes. There can be no justification for adding children to a benefit received on the basis that the mother is already unable to raise her children independently." When the demographic change New Zealand is facing is taken into account, it is clear that labour force is going to shrink in relation to the non-labour force. The graph below shows that the ratio of the combined 0-14 and 65+ populations is going to grow from around 0.5/1 today to 0.7/1 over the next twenty years. The demand for goods and services continues from the non-working population thus increasing demand on the working-age population. Hence it is so important for the government to set in place the legislation that requires beneficiaries to work when jobs are available. open-ended and relatively generous DPB. So there is ample evidence jobs will be there, particularly in the care and health sectors, and ample economic imperative for more sole mothers to participate in the workforce. However, to my mind, an even more important aspect of increasing their participation is the positive benefit for their children. Breaking the inter-generational cycle of welfare dependence won’t happen until children live with at least one working parent who is building their own expectations of a similar life. The New Zealand Herald today published my response to a column by Susan St John, spokesperson for the Child Poverty Action Group. On Friday John Key was on Radio Live with co-hosts Rodney Hide and Willie Jackson. Jackson was predictably getting into Key about the welfare reform, especially the requirement for women who have an additional child on the benefit to be available for part-time work, but Key was fending off the objections effortlessly and convincingly. I rang in to say that I supported the reform but to ask, given most countries are raising the eligibility age for pensions, that life expectancies are moving out, that people are staying healthy for longer, why did he commit to keeping the Super eligibility age at 65 and does he regret it? You can hear the answer here if you select Friday and 12.30pm (towards the end of the half hour slot). But listen to the whole hour because Rodney talking with the PM is worth listening to. Essentially in 2008 National were aware that Labour were planning a widespread campaign of misinformation saying Key was going to raise the Super age and he wanted to put that to bed. 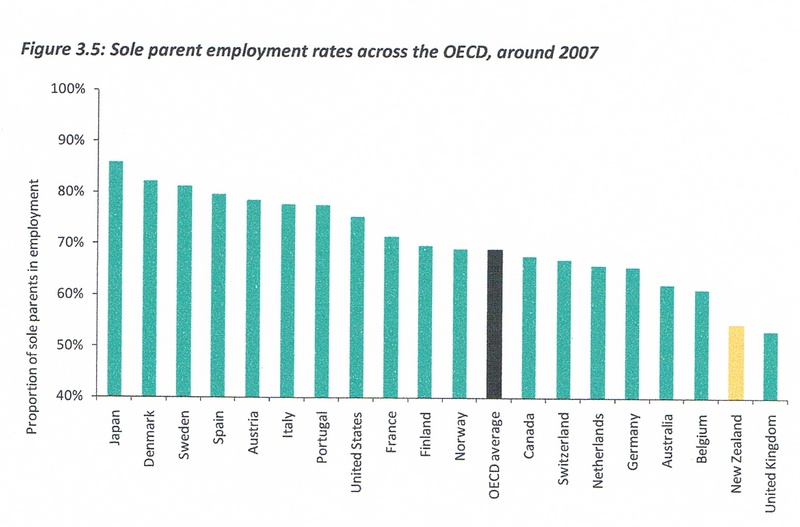 (Ironic when you remember that raising the age was Labour's best policy in 2011). Key also said that Treasury advised him that there were bigger problems to tackle than Super - rising health costs for instance. Super wasn't that big an issue apparently. Rodney observed that the Retirement Commissioner thinks it is however and pushed him on that a bit. I get cut off so missed the exchange. So really we are stuck with around $1.5 - 2 billion worth of unnecessary spending because of politics. I believe voters are prepared to accept a staged raising of the age (similar to what is occurring in the US) and refusing to budge is going to be a problem for Key in 2014. What should National do?